I haven't painted with oil for over 6 months and I was little intimidated to start again. Oil so far is a favorite medium of mine to paint, but I can't use it during the winter, when it's cold. I don't have a studio and as bad as it sounds, I have to go outside to paint during the summer, simply because I don't have enough space for the easel. Of course during the winter I get the most ideas and inspiration for painting with oil, which is very frustrating. So, recently I got myself a new tabletop easel. I was looking around for some time and I wanted to make sure I choose the best one, considering the price of course. Now I understand how convenient it is to have one of these tabletop easels! Yes, it would be nice to be able to use my huge wooden one, but let's face it, how many of us have a real " artist" size studio of their own? - It is light, easily movable but not light enough to tip over! - It's metal, so it doesn't stain, very easy to clean! - It's big enough to hold larger pieces, but it's very comfortable to work on small ones as well! - it's sturdy, yet not expensive, compared to others! - It doesn't come with instruction how to assemble it. I took me some time and 2 broken nails to put it together the right way. Other than that I love it and I recommend it if you are looking for something similar. 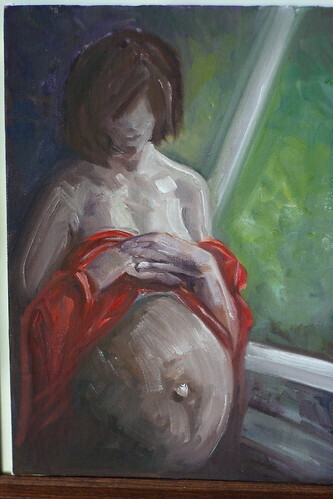 I believe Noelia is one of the most beautiful pregnant women I've seen and I just felt compelled to try and paint her. Don't you think? Have in mind that I don't want to paint realistic, I've changed things as to how I felt it at the time I painted. It would be interesting for me to read your experience with different easels, I am relatively new at this and I would love to hear what you have to say!